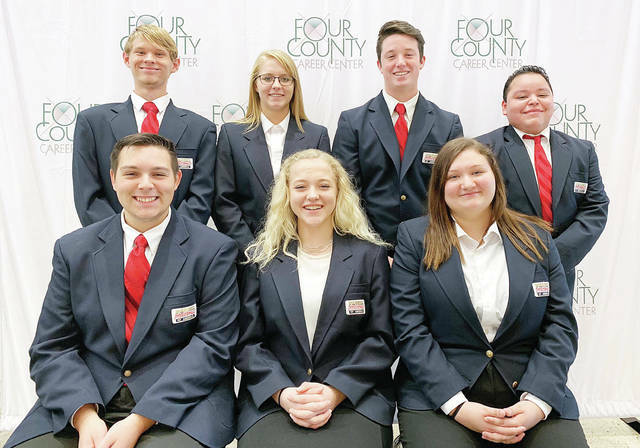 Four County Career Center in Archbold recently elected its Business Professionals of America chapter officers for the 2018-19 school year. Pictured are - front, from left - Trenton Peluso, Evergreen, president; McKenzie Reasor, Bryan, vice president; Mackenzie Davis, Montpelier, secretary - back, from left - Kaleb Ankney, Fairview, AM treasurer; Harley Kunkle, Fairview, PM treasurer; Gabe Bland, Hicksville, AM public relations; Andre Ramirez, Edgerton, PM public relations. The 75-member group sponsors activities, attends leadership workshops, and assists with Northwest Ohio Special Olympics. Advisors are Tina Short, Mary Jo Beilharz, Tim Ricketts, and Matt Geiger. Four County Career Center in Archbold recently elected its Business Professionals of America chapter officers for the 2018-19 school year. Pictured are – front, from left – Trenton Peluso, Evergreen, president; McKenzie Reasor, Bryan, vice president; Mackenzie Davis, Montpelier, secretary – back, from left – Kaleb Ankney, Fairview, AM treasurer; Harley Kunkle, Fairview, PM treasurer; Gabe Bland, Hicksville, AM public relations; Andre Ramirez, Edgerton, PM public relations. The 75-member group sponsors activities, attends leadership workshops, and assists with Northwest Ohio Special Olympics. Advisors are Tina Short, Mary Jo Beilharz, Tim Ricketts, and Matt Geiger. https://www.fcnews.org/wp-content/uploads/sites/45/2018/11/web1_2018-19-bpa-officers.jpgFour County Career Center in Archbold recently elected its Business Professionals of America chapter officers for the 2018-19 school year. Pictured are – front, from left – Trenton Peluso, Evergreen, president; McKenzie Reasor, Bryan, vice president; Mackenzie Davis, Montpelier, secretary – back, from left – Kaleb Ankney, Fairview, AM treasurer; Harley Kunkle, Fairview, PM treasurer; Gabe Bland, Hicksville, AM public relations; Andre Ramirez, Edgerton, PM public relations. The 75-member group sponsors activities, attends leadership workshops, and assists with Northwest Ohio Special Olympics. Advisors are Tina Short, Mary Jo Beilharz, Tim Ricketts, and Matt Geiger.